James Radley had privately entered a Silver Ghost for the 1912 Austrian Alpenfahrt however on the first day of the seven day Trial they were hampered by its three-speed gearbox and failed to negotiate a very steep sharp hairpin bend on the ascent of the Katschberg. Requiring to use reverse gear and needing help from its three passengers to restart this incurred so many penalty points that the crew retired. He vowed to return with a modified Silver Ghost for the 1913 event and in fact he was joined by three other cars to form a factory team specially prepared for the event with four-speed gearboxes, an increase in compression ratio and a larger carburettor. The team gained six awards including the Archduke Leopold Cup. Radley’s car chassis 2260E won overall keeping a clean sheet and setting fastest times on each of the stages. 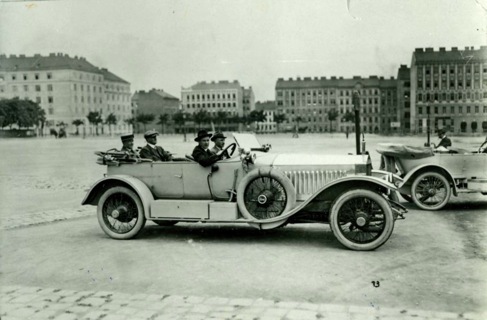 This picture shows Radley’s Ghost with him at the wheel at the weigh-in in Vienna the day before the start of the 1913 Alpenfahrt on Saturday 21 June 1913. 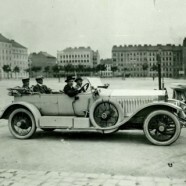 Rolls Royce man John ‘Tubby’ Ward, in cloth cap, is sitting in the rear who for the event acted as riding mechanic.